That was fast. 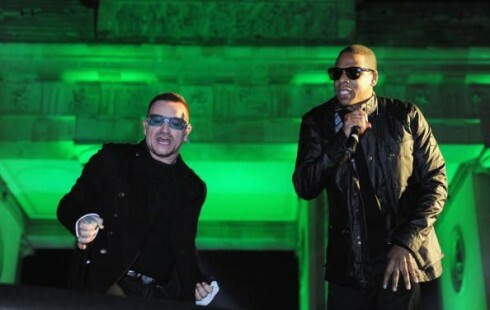 Jay-Z, Bono, The Edge, and Rihanna were just on the celebrity-filled Hope For Haiti Now special on TV, and now we have the mp3 of the performance. It turned out to be a pretty cool song, and the studio version should sound even better. The proceeds from the studio version will go to Partners In Health. It will be on iTunes on January 25th. I have mixed feelings after watching the Hope For Haiti Now special, but anything that generates money for a good cause can’t be a bad thing. So if an awkward conversation between Reese Witherspoon and a random caller or a plea from a billy goat bearded Brad Pitt is what it takes to get America to donate, then let’s do it. musically it was so well done! John Legend Justin Timberlake Beyonce and Mary J Blige's perfomances absolutely were perfect! « The Middle East – "Blood and "The Darkest Side"